Should You Adopt ALM for Safety-Critical Development? Most companies involved in the development of safety-critical devices such as airborne electronic equipment, automotive embedded systems, or medical devices have their tried and tested development processes. They have invested a lot of time, effort and money into formulating workflows and building a tool environment that help them develop high quality products in compliance with all the relevant local or international (FDA, ISO, IEC, RTCA, etc) regulations. So why would they want to replace all that with something brand new? Well, the answer is simple and painful to some: because they are increasingly forced to do so. If you are still capturing and managing your requirements using MS Word files, collaborating on documents using a shared folder with no version control, and possibly using an inefficient Waterfall process to make sure everything is under control, you are essentially throwing money out the window. If you're unlucky, you may become aware in time that your competitors are slowly taking you over. If you're even more unfortunate, you will continue happily and never realize how much these inefficient processes are costing you. So how does ALM increase efficiency? There's a reason most companies in regulated industries are wary of replacing their working methods and adopting ALM instead. The development of life-critical software & equipment is no easy task: not only do you have to adhere to set processes during development, you also need to document practically everything that's happening during the lifecycle, and submit comprehensive documentation & reports to regulatory bodies before your product can be put out on the market. Creating the adequate processes that allow you to do this takes ages and immense effort – but once you have them figured out, simply performing these activities and processes in practice is no stroll in the park either. That is exactly where Application Lifecycle Management platforms can help. By allowing you to enforce & automate even complex processes, automatically recording audit trails, and enhancing collaboration between your departments and team members, ALM software such as codeBeamer can take a lot of the burden off of your teams' shoulders. Safety engineering and risk management are greatly facilitated, as is the efficient management of multiple product variants. Artifacts related to the management of requirements, software development and quality assurance & testing can be associated throughout the lifecycle, turning traceability from a headache into a one-click, exportable report. ALM creates a less stressful, more efficient work environment for your development team(s), saving them a lot of time, which translates to saving costs for the entire organization. If you're managing a small company, it's just natural that you will work with what you have – MS Office is widely available, and shared folders are free. A bit of manual work here and there to ensure data consistency and traceability, and your compliance requirements are covered. (Sort of.) It's understandable that you're not eager to make tool investments right at the start. However, not only do your team's work hours add up to a lot, you will also need to factor in the risks resulting from these error-prone manual activities. If you think about it this way and start calculating the Total Cost of Ownership (TCO) rather than actual cost, "free" isn't really free any more. Imagine having your product's release delayed by two months trying to prepare for the compliance audit, and you'll understand why more and more companies such as Medtronic, Dassault Falcon Jet, and Mercedes-Benz are opting for the use of codeBeamer ALM in their safety-critical development efforts. 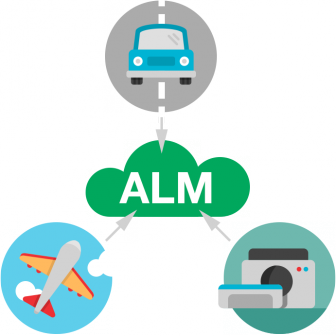 Choosing the right ALM solution is a difficult task (although our ALM evaluation guide helps a lot), but concluding whether or not you should be using ALM at all is a simple decision. To learn more about the benefits codeBeamer ALM could bring you, get in touch with us for a short live demonstration, free of charge.